Achieve calm, manageable locks with the René Furterer Lissea Leave-In Smoothing Fluid; an ultra-nourishing formula that works to restore smooth, shiny hair with static control. Fortified with an innovative Thermal Protecting Complex, the lightweight fluid defends against heat damage and humidity, whilst Natural Alkekenge Extract fights frizz and flyaways to reveal sleek, soft strands from root to tip. 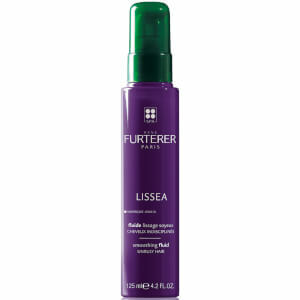 Can be applied to damp hair before blow-drying, or to dry hair as a finishing product. Fragranced with uplifting notes of Bergamot, Jasmine, Rose and Ginger. Apply a small amount to towel-dried hair. Do not rinse. Proceed with blow drying. For a perfect finish, apply a small amount to hair after blow drying. Water(Aqua), Cetearyl Alcohol, Ethylhexyl Palmitate, Divinyldimethicone/Dimethicone Copolymer, Beeswax (Cera Alba), Bht, C12-13 Pareth-23, C12-13 Pareth-3, Cetearyl Glucoside, Cetrimonium Chloride, Citral, Citronellol, Disodium Edta, Fragrance (Parfum), Geraniol, Hexyl Cinnamal, Hydroxycitronellal, Inulin Lauryl Carbamate, Limonene, Linalool, Persea Gratissima (Avocado)Oil (Persea Gratissima Oil), Phenoxyethanol, Physalis Alkekengi Fruit Extract (Physalis Alkekengi Extract) Prinus Amygdalus Dulcis (Sweet Almond) Oil (Prinus Amygdalus Dulcis Oil).